The "Letter to The Grand Duchess Christina" is an essay written in 1615 by Galileo Galilei. The intention of this letter was to accommodate Copernicanism with the doctrines of the Catholic Church. Galileo tried to use the ideas of Church Fathers and Doctors to show that the condemnation of Copernicanism would be inappropriate. Christina was the daughter of Charles III of Lorraine and granddaughter of Catherine de' Medici. In 1611 Galileo was informed by a friend, Cigoli, “ill-disposed men envious of your virtue and merits met [to discuss]... any means by which they could damage you.” The number of scholars who disapproved with his Discourse on Floating Bodies, or were simply ill-spirited toward Galileo grew, but other than one letter from Niccolò Lorini there was not much discussion about the issue for the remainder of the year. Late in 1613, Galileo's former student Benedetto Castelli, a Benedictine monk, wrote to Galileo about the events at a recent dinner with the Grand Duke Cosimo II de' Medici. In the course of conversation at the dinner Cosimo Boscaglia, a professor of philosophy, argued that the motion of the Earth could not be true, being contrary to the Bible. After dinner ended, Castelli was called back to answer scriptural arguments against the motion of the Earth from Christina. The monk took on the role of theologian in response, and convinced everyone there except the Duchess (whom he thought was arguing mainly to hear his answers) and Boscaglia (who said nothing during this dialogue). 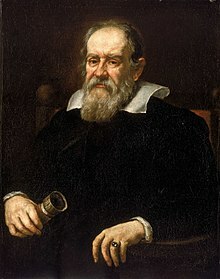 Galileo decided to address Christina because of her desire to learn more about astronomy. Christina's position of power would also give the letter more exposure to other nobles and Church leaders. Galileo replied with a long letter giving his position on the relation between science and Scripture. By 1615, with the controversy over the Earth's motion widespread and increasingly dangerous, Galileo revised this letter and greatly expanded it; this became the Letter to the Grand Duchess Christina. The letter circulated in manuscript but was not printed until much later, when the Inquisition had condemned Galileo. It appeared in Strasbourg in 1636 with both Italian and Latin text, as seen in the top right image. It was suppressed in Catholic jurisdictions, as were all works of Galileo at that period which dealt with that subject. I hold the sun to be situated motionless in the center of the revolution of the celestial orbs while the earth rotates on its axis and revolves about the sun. They know also that I support this position not only by refuting the arguments of Ptolemy and Aristotle ... especially some pertaining to physical effects whose causes perhaps cannot be determined in any other way, and other astronomical discoveries; these discoveries clearly confute the Ptolemaic system, and they agree admirably with this other position and confirm it. This approach caused some, including Dominican friar Niccolò Lorini, to complain to the Inquisition, which tried and eventually condemned Galileo of suspicion of heresy. Galileo starts the letter with a little flattery of the Grand Duchess. He tries to build her up as an authority figure and then presents his own credentials to show that he has similar authority. Since The Grand Duchess was a person of high authority but did not have much knowledge in the field of astronomy he was able to write the letter in a way the common person is able to understand. He attempted to manipulate the Duchess by attempting to attain her sympathy by mentioning the unfair attacks made against his honor. He tried to portray “himself as a man of good will who seeks only to disclose the truth.”  He states he was motivated to write the letter to justify himself to men of religion he holds in great esteem. Critics of the Copernican system used the Battle of Gibeon from the tenth chapter of the Book of Joshua as scriptural evidence against heliocentrism. In the chapter, Joshua asks God to stop the Sun in order to lengthen the day and allow the Israelites to win the battle. When taken literally, this story implies that the Sun is mobile. Galileo adopts an Augustinian perspective, while also marginalizing it later. In the Letter to the Grand Duchess he references Augustine of Hippo’s work De Genesi ad Litteram, which calls for either a compromise between literal translation of scripture and astronomy or an allegorical standpoint, which could resolve future astronomical conflicts arising that could jeopardize the validity of the Bible. Whereas his critics took the stopping of the Sun to mean that Sun halts its orbit around the Earth, Galileo interpreted it with a different astronomical viewpoint. He claimed that God stopped sunspots rather than the Sun itself, implying that it was the relationship between Sun and Earth that stopped its motion. Thus, he argued that the Earth moves around the Sun. Galileo wrote the letter to the Grand Duchess in an effort to convince her of the compatibility of Copernicanism and Scripture. This served as a treatise under the disguise of a letter, with the purpose of addressing the politically powerful, as well as his fellow mathematicians and philosophers. The goal of the secondary audience was targeted to whom he believed was condemning Copernicus. The failure of this stratagem was that he used Christina as his titular audience, instead of the shadow audience he truly sought to persuade. The result was that he was attempting to move an audience unfamiliar with his chosen topic, instead of those who were already disposed on the topic of the movement of the heavens. "With his deprecating tone Galileo effectively marks off a group of philosophers and theologians as adversaries whose faults he proceeds to define". Within that group were progressive Aristotelians, including Bishop Dini, Cardinals Bellarmine and Barberini, as well as famous Jesuit astronomers at the Collegio Romano (Roman College). These men were open to scientific demonstration to progress Copernicus' theories, however Galileo attacks them stating that they "determine in 'hypocritical zeal' to preserve at all costs what they believe, rather than admit what is obvious to their eyes." This compounds his problems rather than aiding him. Moreover, his letter misses out on key facts that include the Church's non-attacking stance on Copernicus when the canon proposed his heliocentric model. A Dominican theologian Tolosani made an unpublished attack on the Copernican system as early as 1544. ^ a b c d e f g Moss, John Dietz (1983). "Galileo's Letter to Christina: Some Rhetorical Considerations" (PDF). Renaissance Quarterly. 36 (4): 547–576. doi:10.2307/2860733. ^ a b c d Reeves, Eileen (1991). "Augustine and Galileo on Reading the Heavens". Journal of the History of Ideas. 52 (4): 563–579. doi:10.2307/2709966. Stillman Drake (translator and editor) (1957). Discoveries and Opinions of Galileo. New York: Doubleday Anchor Books. ISBN 0-385-09239-3. This has the full text of the letter, with commentary, as well as other short works of Galileo. Maurice A. Finocchiario (1989). The Galileo Affair. University of California Press. ISBN 978-0-520-06662-5. This compilation of relevant original documents also includes a 43-page introduction by the author. This page was last edited on 5 February 2019, at 12:45 (UTC).